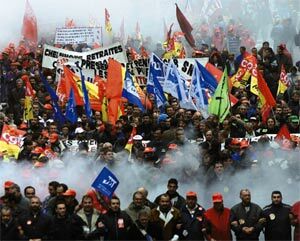 A short history of the massive strike movement against welfare reform in France in 1995. During November and December of 1995 France was gripped by the largest strike movement the country had seen in recent years. After three weeks of strikes workers forced a government climbdown over the issue of changes to pensions of public sector workers. Comparable in size and strength to the recent movement against the CPE employment law, the strike movement of 1995 enjoyed popular support and involved hundreds of thousands of workers. The strikes were responsible for immobilising much of the country's infastructure. The May presidential elections had seen a victory for Jacques Chirac of the conservative RPR party and the coming to office of Alain Juppé as the new prime minister. The new prime minister proposed a series of welfare cutbacks aimed at reducing the deficit of the country's social security system. The Juppé Plan, as it was known, included increases in premiums for healthcare, reorganisation of the nation's railway networks, cutting welfare to the unemployed, imposing new taxes and making changes to the pension eligibility age for public sector workers. If introduced, these changes to the pension age would have left many workers unable to draw a full pension until many years after their private sector counterparts had been eligible to receive theirs and would have heavily increased the amount that workers would have to pay in in order to receive them. In early autumn the first attempt at practical implementation of the Juppé plan was met with stiff resistance from workers. In response to proposals of freezes on their pay, a mass walkout of public workers took place on October 10. Rail and air travel were paralysed and most domestic and international flights were cancelled. Much of the railway network came to a halt as did the Paris metro system and bus service. Schools and universities were closed as teachers and students walked out in protest at the plans, post offices were forced to shut and mail was left undelivered. Striking workers filled the streets of every major French city and town and large demonstrations against the cuts proved an impressive show of strength and an indication to the high level of support that the strikes were to enjoy in the days ahead. Another general strike was announced on November 24 after a smaller walkout on November 21. This strike was to continue in many sectors throughout the weeks ahead. Transport workers again took the helm, crippling most of the rail, bus and subway systems as well as causing serious disruption to air travel. Demonstrations took place in the major cities, with marchers taking up the rallying cries of "Bye, Bye Juppé". Utility workers joined in the strike, and by November 30 a strike by gas and electricity workers had forced the government to buy electricity from Britain and Spain. Action by postal workers caused a 45% shutdown in mail operations. Strikes in the private sector had been sporadic and few, but by early December this began to change. By December 4 workers in insurance companies and banks had begun to join the strike. The new month also saw renewed enthusiasm in the strike from healthcare workers, some of whom had initially been apprehensive towards the prospect of being involved in prolonged walkouts. Feeling that they must be involved in the growing movement but an unwillingness to endanger their patients led to the adoption of the "safe strike" tactic. Nurses and other workers maintained safe levels of staff at work so as not to endanger lives, dividing their time between picketing and caring for their patients. Strike banners were hung up in wards, and efforts to explain their actions to patients promoted an atmosphere of solidarity. December also brought with it a new wave of militant feeling. Although often confined to groups of workers with a history of militancy, clashes with police became commonplace. Striking railwaymen had been holding massive public meetings at stations and on the rails since the start of the strike, and attempts by police to break them up often resulted in pitched battles. Fighting also broke out at the Channel Tunnel, which had been blocked by workers as the strike entered its third week. Workers blockaded the toll booths, and with nobody willing to work them the last section of the country's rail network still operating was shut down. Ports were also blockaded by dockers and truck drivers, and the government responding by deploying troops to prevent fuel shortages. The north-eastern town of Freyming-Merlebach saw large battles fought between striking miners and riot police. Matching the police armoury with crowbars and rocks, miners built barricades in the roads, on one occasion even burning down the offices of a mine company. In a country with an unemployment rate of 12%, solidarity with the jobless was seen as important. This often took form during the demonstrations and marches that filled the streets of France during the weeks of the strike, with strikers being joined by thousands of unemployed workers. The Pompidou Centre in Paris was occupied by the homeless and unemployed for a short while, and meetings took place with strikers to forge links and discuss how practical solidarity between them could be applied to the movement. Owing to the extreme pressure that the strike had put on the economy, the strike officially came to an end on December 15 when Juppé's government agreed to scrap the plans for pension reform, although refusing to back down over welfare and health cuts. Nevertheless, the unions still called an end to the strike. Massive demonstrations took place throughout the coming week however, including one of nearly a million workers in Paris on December 16. With many strikes being out of the control of the unions, owing to the small percentage of workers who were actually members of one (around 30% in the public sector), many workers didn't end their strikes immediately, some holding out as late as December 22. The strike movement remained popular throughout, and polls showed a majority of French people consistently supported it. While mainly a strike of public sector workers, the solidarity shown from sections of the private sector, the support given to the strikes throughout and the determination and solidity of the strikers ensured a victory, or at least a partial one.